It seems rare to encounter exciting new board games. Obviously there are the classics: Chess, Scrabble, Monopoly. 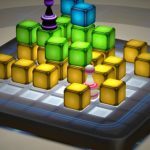 CubeSieger ($0.99) is Rozetta’s attempt to join these gaming greats. They’ve already partially succeeded in Japan, where Apple chose to use the game as a demonstration app for the iPhone 4S in their stores. In the end, however, I think I’ll stick to chess. In CubeSieger, you face an opponent on a 6×6 board. You each have one piece, white or black. Each time, you move one square– horizontally, vertically or diagonally – and afterwards can place a block on the board. The opponent then moves and places a block. You can’t move where there are blocks, but you can ascend the blocks. Once you’ve ascended, you can’t descend, with the same rules applying to your opponent. 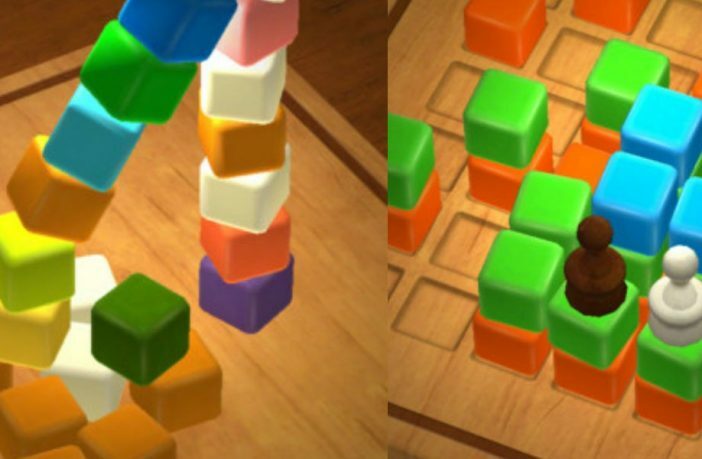 The loser is the one that is forced onto the third layer of blocks. The rules are easy to learn, and the app explains them well. Similarly, the board is rendered in 3D and it’s easy to change the perspective by dragging your finger along the screen, so you never have any trouble seeing what’s happening. The graphics are clean and simple, and you can change the theming of the visuals to more personalised themes such as ‘girly’. If you want, you can even change the material that the board’s made of, although the default wood setting is easily the most aesthetically pleasing. The extensive options extend to the gameplay, with single, multiplayer and network modes provided. There are four single player difficulties, ranging from easy to expert. Although the higher levels are certainly challenging, I still managed to win an expert game after a few attempts, so it might be good to have a still more difficult computer opponent. In multiplayer, you can limit the length of a game to eight minutes or less, or allow it to continue until finished (without a time limit). The mode works well, swapping the perspective between players smoothly so that you can perch at either end of your iDevice to play. In network mode, you can connect to nearby bluetooth devices and play against them, or alternatively connect to devices via game center. Unfortunately, when I tried to play a game via game center, my iPhone struggled to find anyone for me to play against. I’ve also not been able to try out the bluetooth mode. If that’s not enough options for you, there’s even a challenge mode full of set puzzles for you to complete in a certain number of moves, achievements for you to acquire and a block-stacking mode where you stack blocks for no apparent reason. 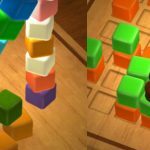 Although the block stacking is fun, it seems a little pointless. 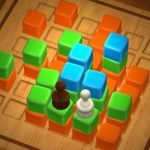 Conversely, challenge mode attempts to be intellectually challenging but ends up not being all that fun, with puzzles generally fairly easy to complete. Those that aren’t are still somehow not particularly engaging. Although I’ve given CubeSieger a lot of praise, there is sadly one major hindrance: its gameplay. Whilst it’s brilliant, it’s not quite deep enough to allow mastery of it. Within minutes of starting the game, I managed to settle into a tactical groove that allows me to win against the computer frequently. This means that I can’t see myself playing the game much more in the future: I don’t find it strategically challenging enough. I’m not saying I always win, but that if I win, I know it’s not because of my engaged thought process but the fact that there are clear tactics that help you win the game, without many alternative tactics to counteract them. Nevertheless, the game is still a joy to play while it’s fresh. Even the interface is fun to use, being intuitive and creative at the same time. It’s a shame that the gameplay doesn’t allow more tactical variety, but it still easily offers great value at just $0.99. 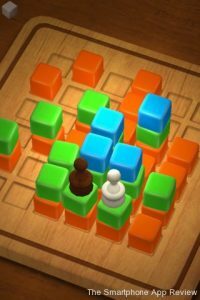 If you’re keen on strategy board games, I recommend that you invest in CubeSieger. Sounds like a cool board game.